Sokha Beach Resort is set amidst 23.5 hectares of beautifully landscaped beachfront and garden with its own 1.5 kilometer pristine white sandy beach. Voted amongst the Best New Hotels in the World in Condé Nast Traveler Magazine’s Ninth Annual Hot List 2005, this resort is certainly a top choice when vacationing in South East Asia. Kindly note that during busy periods, it will be a bit difficult to avail fo the services of Jasmine Spa. It is recommended that the guest pre-books the treatment ahead. Special Promotion for customers staying within May until September! 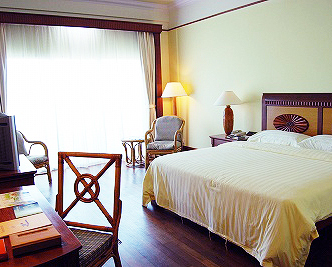 ■Promotion 1：Guests staying two nights can avail of another night free plus round trip transfer to Phnom Penh. Transfer fees are included in the rates displayed. ■Benefits ： One free dinner and a complimentary one hour massage for 2 persons. ■Benefits： For guests staying 2 nights or more, you automatically get 1 night free. If you book 40 days before promotional period, we will offer a room upgrade (subject to availability) with a 30 minutes Khmer Traditional Massage. ※Kindly note that all reservations are final. Any amendment or changes will result to the implementation of our company cancellation policies.